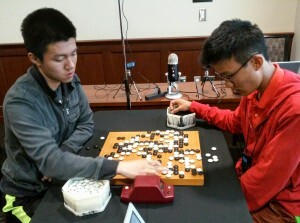 Albert Yen 7d and Ary Cheng 3d swept their divisions in the Redmond Cup finals at the US Go Congress. 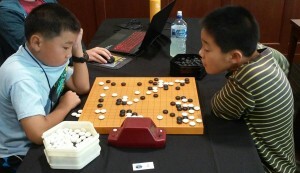 The preliminary rounds were held online (see E-J 7/8/15) and saw both boys emerge on top, 15-year-old Yen with a perfect record, and 9-year-old Cheng winning 5 out of 6 games. The Senior Division (under 18) pitted Yunxuan Li 6d, age 17, with 5 wins, against Yen in a best 2 out of 3 final. In the Junior (under 13), Raymond Feng 3d, age 11, was the other finalist. Cheng and Feng both were AGA rated at 1 dan during the qualifiers, but defeated higher ranked opponents throughout the event. Both boys are playing at 3 dan in the US Open, and doing quite well, proving once again that it is very hard to pin serious kids down to a given rank as they often improve at lightning speed. The Senior division games were also popular on the AGA’s Youtube Channel, which featured live commentaries by Calvin Sun 1P, with Justing Teng 7d and Lionel Zhang 7d streaming video, and both divisions were broadcast live on KGS as well. All of the streamed videos remain available on the AGA channel here. All four Redmond finalists won a free trip to congress to compete, and will receive $300 for first place, and $200 for second, courtesy of the American Go Foundation, as well as Redmond Cup trophies. - Story and photos by E-J Youth Editor Paul Barchilon. Top: Yunxuan Li 6d (l) vs. Albert Yen 7d (r); Bottom: Raymond Feng 3d (l) vs. Ary Cheng 3d (r).